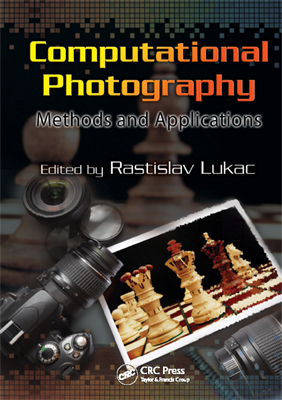 A new book on Computational Photography published! Explore image processing and analysis techniques for computational photography at the system design, algorithmic, and application levels! Graduate students in the departments of electrical engineering, computer engineering, computer science, and art, whose orientation is computer vision, digital imaging, digital signal and image processing, computer graphics, and multimedia. Scientists and engineers working in computer vision, digital imaging and computer graphics either theoretically or in applications, such as photography, computer vision systems, visual communications, surveillance, multimedia systems, medical imaging, art, and astronomy. Computational photography refers broadly to imaging techniques that enhance or extend the capabilities of digital photography. This new and rapidly developing research field has evolved from computer vision, image processing, computer graphics and applied optics—and numerous commercial products capitalizing on its principles have already appeared in diverse market applications, due to the gradual migration of computational algorithms from computers to imaging devices and software. Because of the urgent challenges associated with emerging digital camera applications, image processing methods for computational photography are of paramount importance to research and development in the imaging community. Presenting the work of leading experts, and edited by a renowned authority in digital color imaging and camera image processing, this book considers the rapid developments in this area and addresses very particular research and application problems. It is ideal as a stand-alone professional reference for design and implementation of digital image and video processing tasks, and it can also be used to support graduate courses in computer vision, digital imaging, visual data processing, and computer graphics, among others.